ALL of Wayne's music is now available for MP3 Download, right here at Picklehead! Click here to go to Wayne's MP3 Download page. 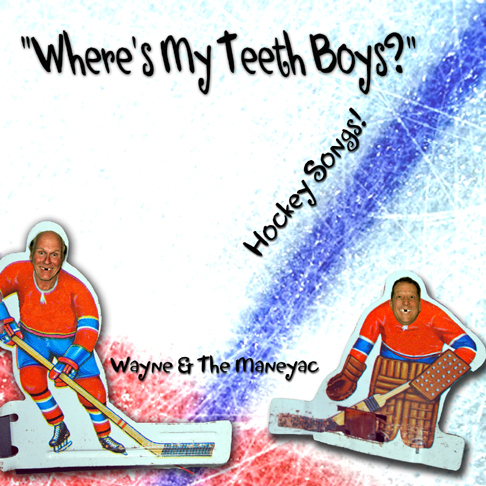 Click here for Wayne's new, limited-release, blast-from-the-past album! This is Wayne's newest album, a long time in the making. Why is it called "All Over the Map"? First because Wayne traveled all over the map to write and record this stuff. But mainly it's because it covers a whole bunch of different musical styles. This new version comes complete with a clarinet part and a horn section. There's a funny acapella piece about driving long distances across the plains. There are several old-timey rock songs. There's a touching, well-produced song that Wayne wrote for his daughter's wedding. There are several bluegrassy banjo songs, including two live recordings. There are two hockey songs. There's even a beautiful spoken word piece. So when it comes right down to it, "All Over the Map" is definitely a fitting name for this album. And it's definitely a very interesting album that you're going to want to get. Check out the song samples below, and note that you can get this album as either a CD or as a digital download. Click here to go to Wayne's MP3 page. Each song on this CD is now available for MP3 Download for just 89¢ per song! Brand new hockey songs album! Wayne's first all-new, original CD in three years! and even an appearance by his grandson! To promote his best songs to radio, Wayne compiled this collection, which truly qualifies as a "Best Of" CD. 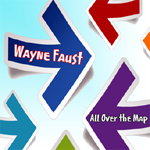 If you only want to get one Wayne Faust CD, this is the one! Featuring ALL NEW songs Wayne wrote for and about various places in his travels. He spent a month in the studio recording these songs, so there is some great stuff here. Long-time Faust fans know that Wayne writes some award-winning serious songs. A few of them have appeared along with the comedy music on Wayne's other CD's. Many fans have asked when he was going to do an album of just those kinds of songs. Well, he finally did. After many, many hours in the studio this fall, Wayne completed this album of the sweetest recordings of his career. Keep in mind that this is NOT COMEDY MUSIC! Lots of that appears below. But check out the song samples for this new CD and we think you'll agree that this is great stuff - and mellow too. Hey, what a title! Mellow Stuff indeed. A great studio CD, featuring new recordings of some Faust & Lewis classics, as well as some new funny and serious songs by Wayne. Lots of hours went into this one. Check out the song samples below. later in the evenings when the show gets warm and fuzzy. Side two recorded live at the legendary Bucksnort Saloon. Wayne's first recording still a GIGANTIC favorite today! Wayne finally put all of his great Christmas songs on one CD. Mostly trashy, but he closes with two songs you can play for Grandma. Listen to a song sample: Santa Claus Is A Big Fat Turd! Wayne wrote some of these songs for the members of his church in Colorado, who showed his family such unbelievable kindness during a trying time a few years back, when his wife went through some very serious surgery. This will be a real departure for some long-time Faust fans, but there is some seriously good stuff here. A few of these songs have already been picked up by Christian recording artists. Also available, the four funny CDs from Faust And Lewis! Faust & Lewis "Back To the Bay"
Faust & Lewis "Classy Trash"
Faust & Lewis "Live At Put-In-Bay"
Faust & Lewis "We Must Be Crazy"
or order these CDs here!